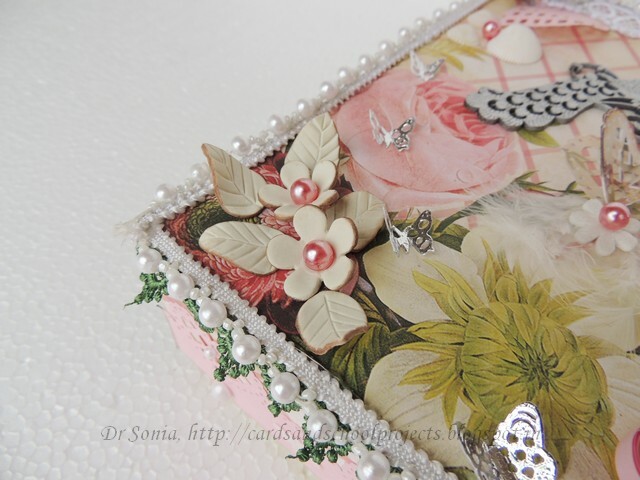 Punched the pattern paper with a Martha Stewart Lattic heart and added pearls, tiny plastic flowers and pearly leaves on the front of the altered box. 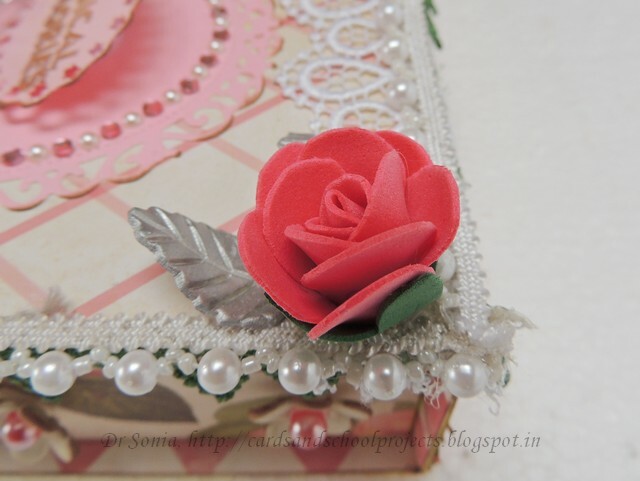 Made a stick pin with a shell shaped bead ,pearls and a metallic star shaped bead.Added a metal framed charm sentiment "bloom" to my paper flower! 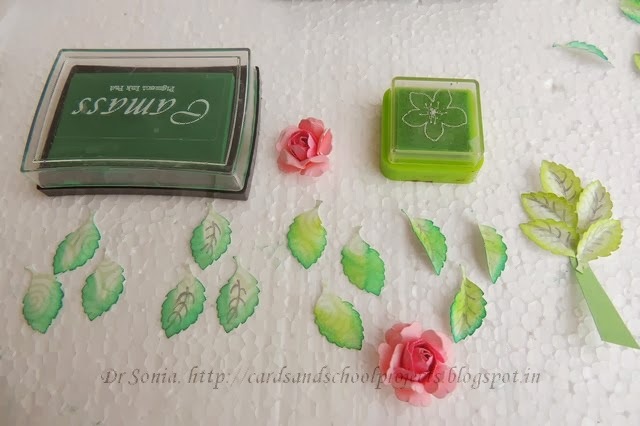 I have an obsession with leaves- Not only do I handcut my leaves, I cant resist buying leaf punches and now that I have a die cutting machine I cant resist leaf dies!! On Pinterest I realized that sometimes even the simplest of pictorials are pinned! 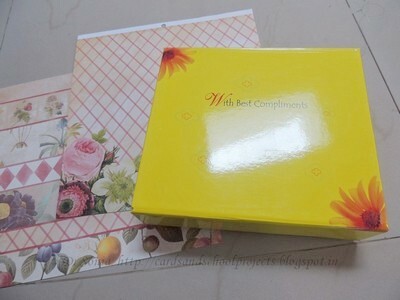 My mini leaf tutorial on this Recycled CD Box was so simple but its actually been pinned quite a bit! So sharing a 8 simple paper-crafting tips especially for newbie paper crafters to add a bit of that extra jazz to your leaves be they hand-cut, die cut or punched . 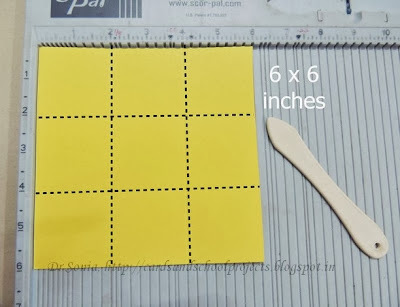 1.Cut out your leaves from pattern paper! -I punched out these leaves from a swirly pattern paper. 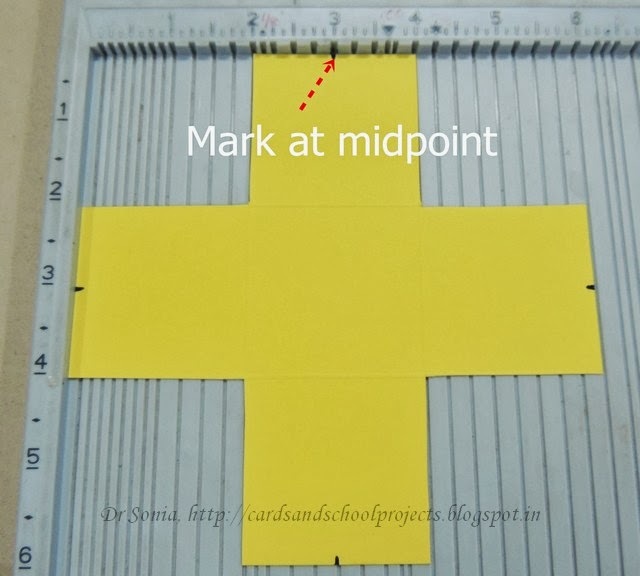 To get your punched leaves to point to either side punch out some leaves on the reverse of the pattern paper! The pic shows a Faber castell ink-pad[available in India] and my daughter's blackboard duster sponge which I used to apply the ink to the edges of the leaf! 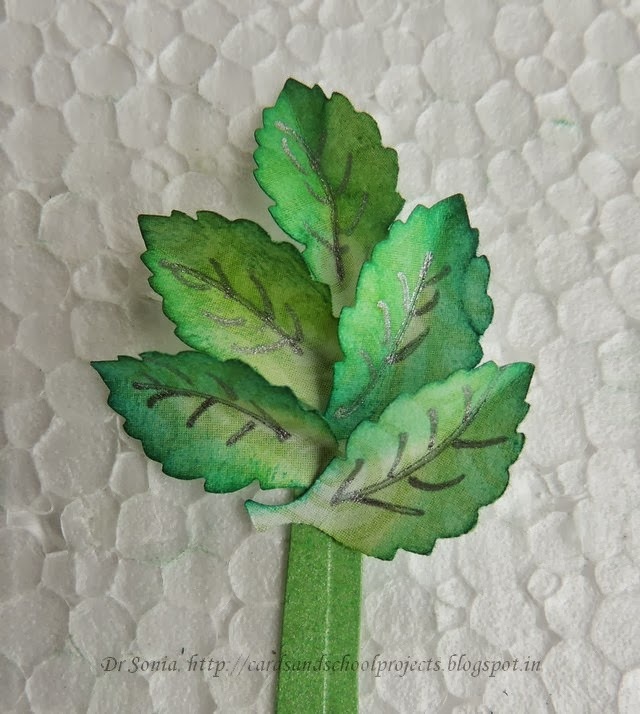 6.Draw veins with a green/silver/gold gel pen- your leaves will literally shimmer! 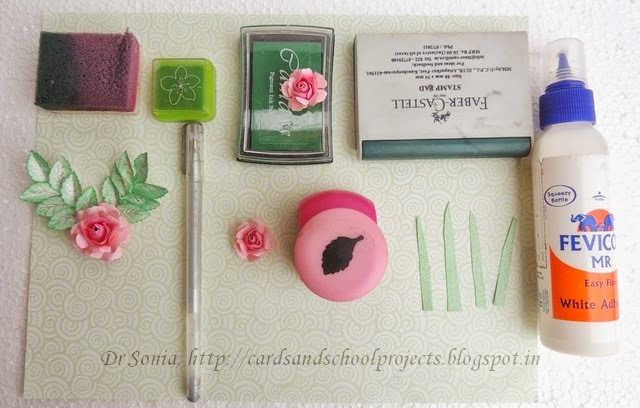 7.Make a branch by sticking your leaves on a piece of sturdy green card stock. 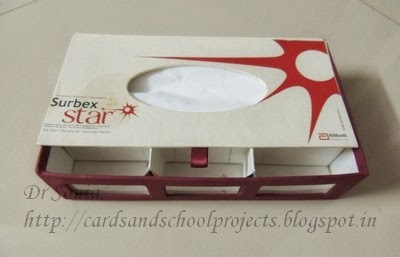 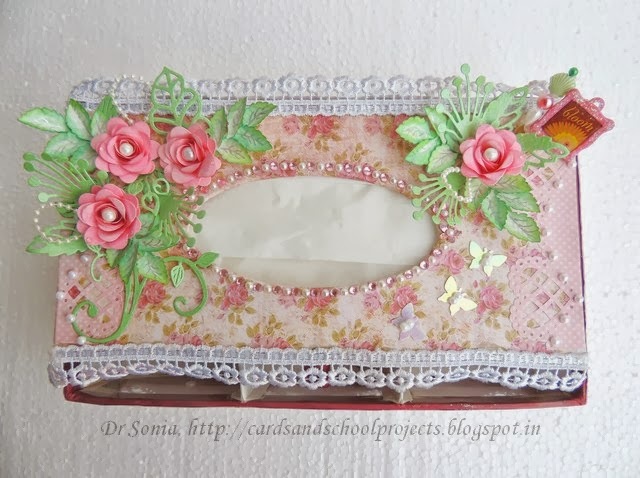 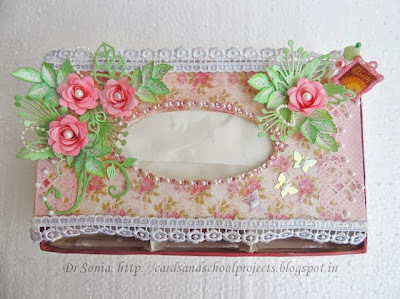 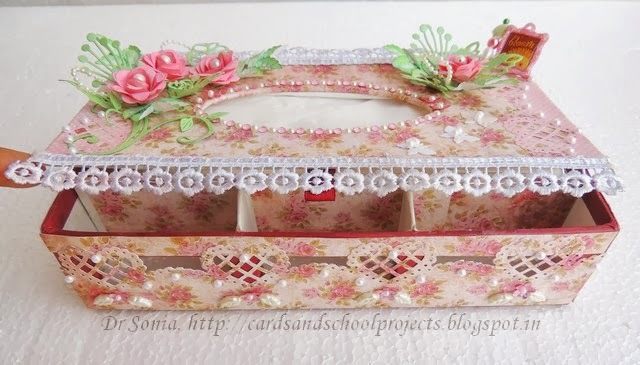 Now back to my altered tissue box,It has 3 compartments on the front and I lined the inside of these little compartments with the same floral paper too. 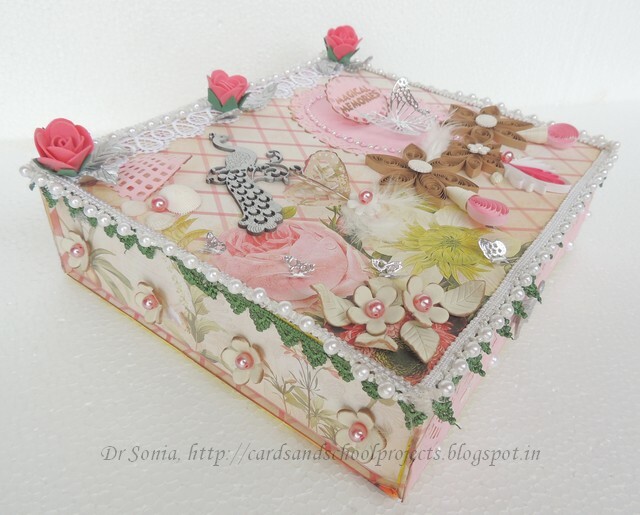 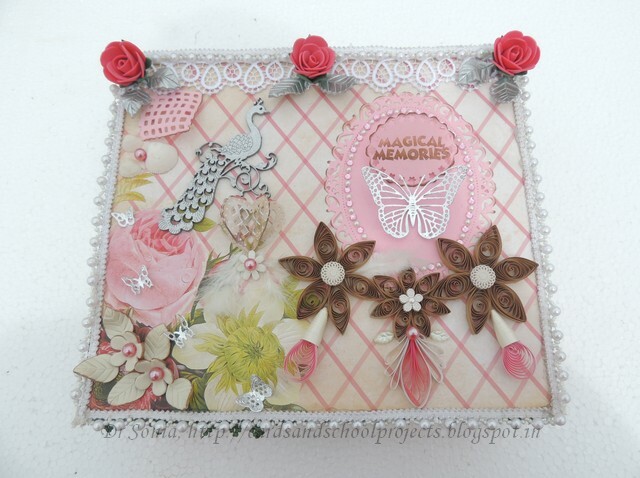 At times projects look more glamorous in their photographs but I wasnt so lucky with this one and for the life of me I couldnt capture the true beauty of this altered box on camera!! 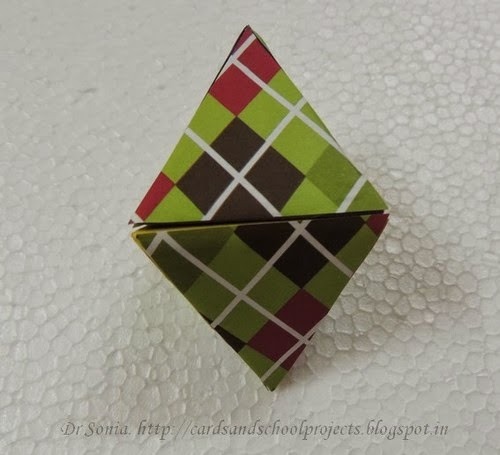 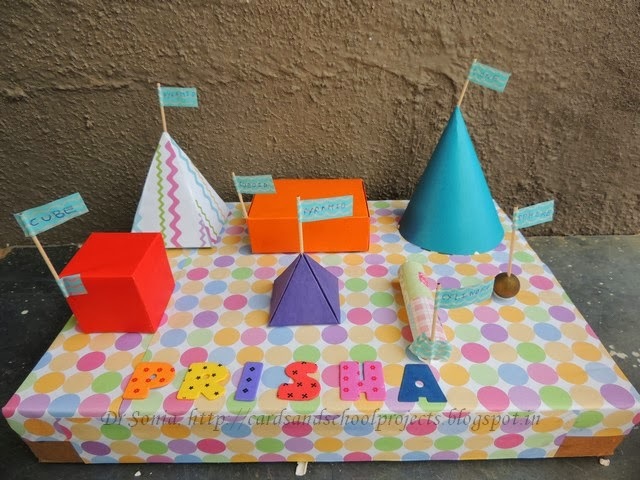 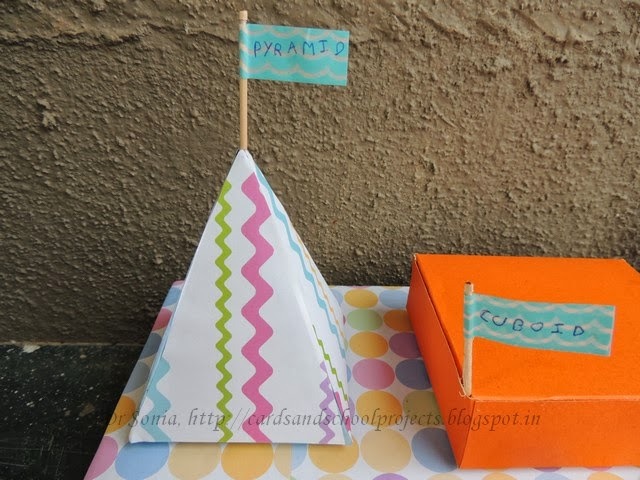 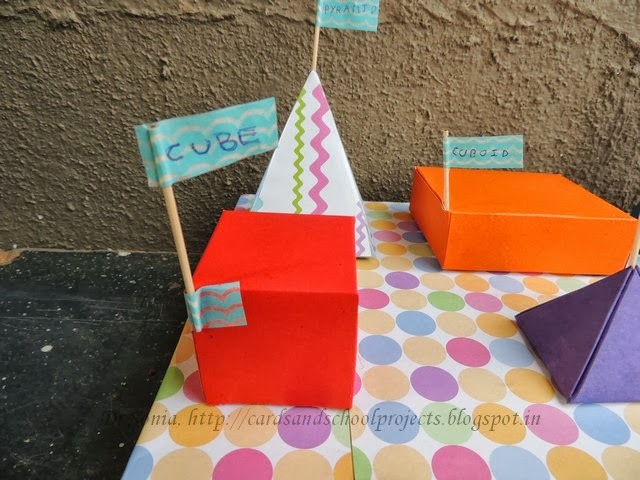 Dear friends Thank you so much for the sweet support on my Paper Pyramid Tutorial.I had made 2 extra pyramids for that tutorial and we used them to make easy Paper decorations . 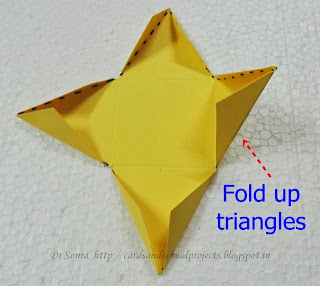 These paper ornaments are super easy to make. 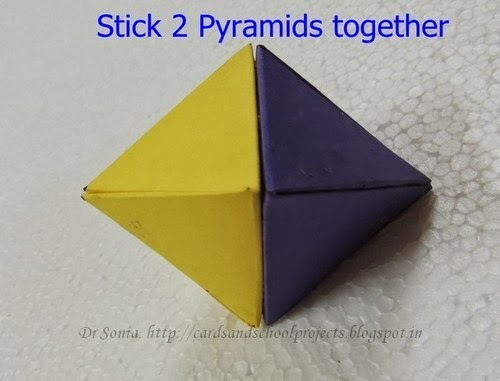 Stick 2 pyramids together at the base. 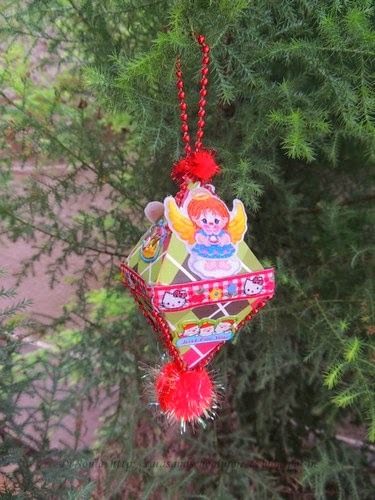 And you get a diamond shaped paper ornament! 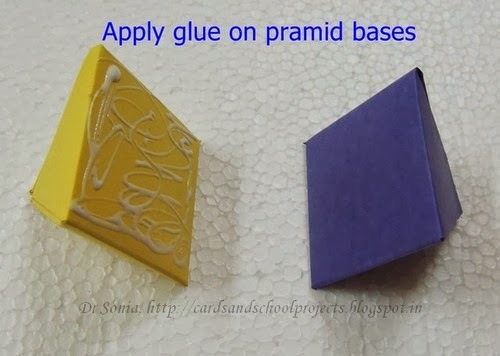 Our glue smeared paper diamond didnt look so cute so we stuck pattern paper on it to pretty it up. 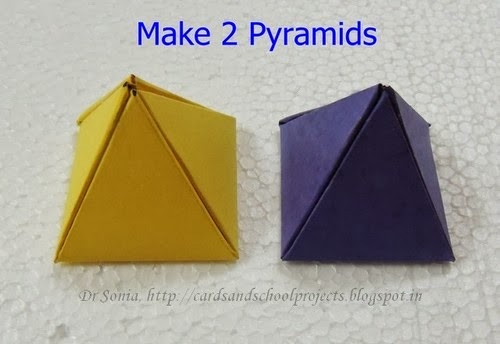 The base of our pyramids are 2 x 2 inch squares and to cover the diamond we used 8 triangles made from of 2 x 2 inch squares of pattern paper. 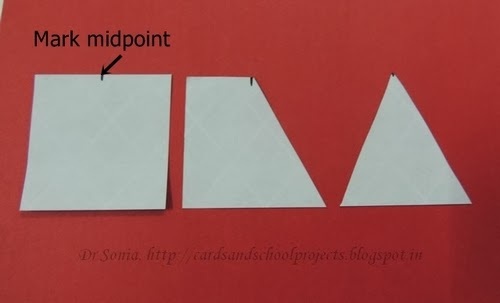 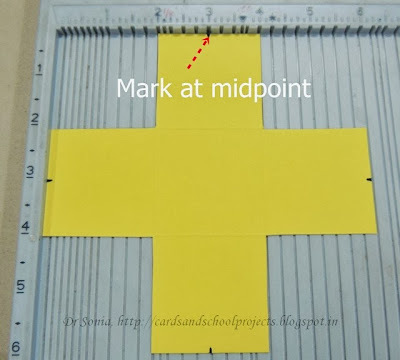 To get the perfect sized triangles to cover your diamond ornament:Mark the midpoint of one side of the 2 x 2 inch square and cut from this point to both bottom corners of the square to get a triangle which will perfectly cover the side of your paper diamond ornament. 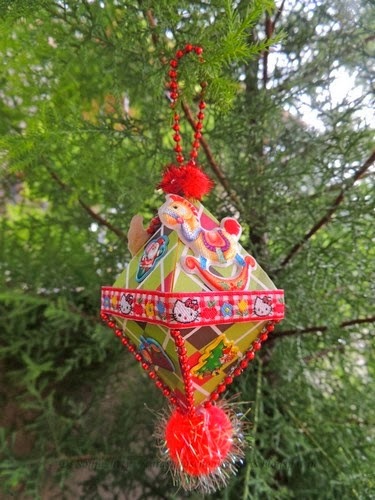 I didnt like the gap between the pyramids so stuck a Hello Kitty ribbon on the center of our paper diamond decoration. 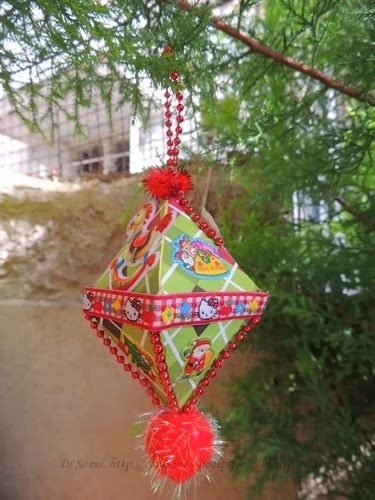 My little one had a lot of fun sticking Christmas themed stickers on each face of our paper ornament .To add to the festive look we added glittery pom pom balls on the tips of our paper diamond decoration. 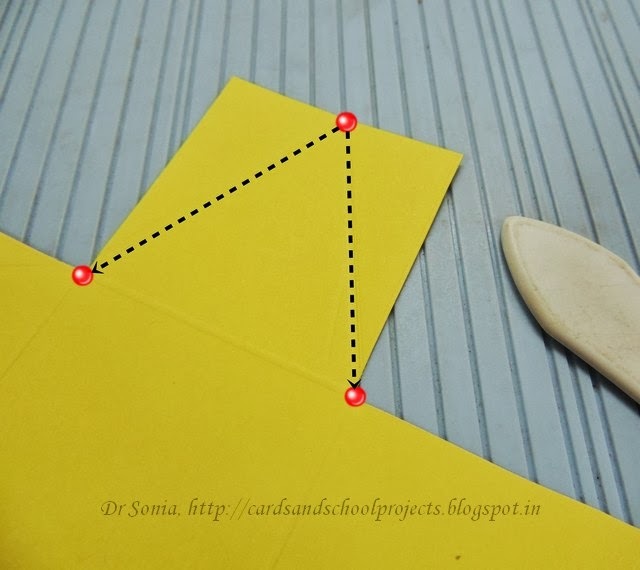 These easy DIY paper decorations can be made in all sizes and themes and would look just awesome to showcase family photos. 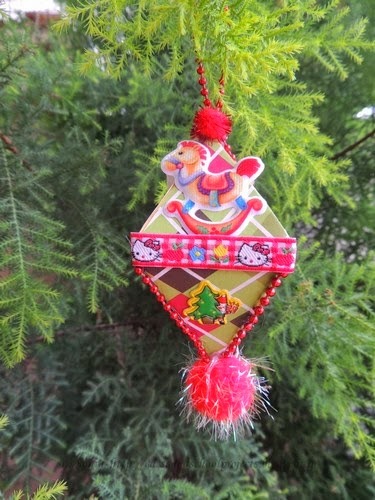 Another idea is If you hoard stickers like me these paper ornaments would be a fun way to use up some of that sticker stash! 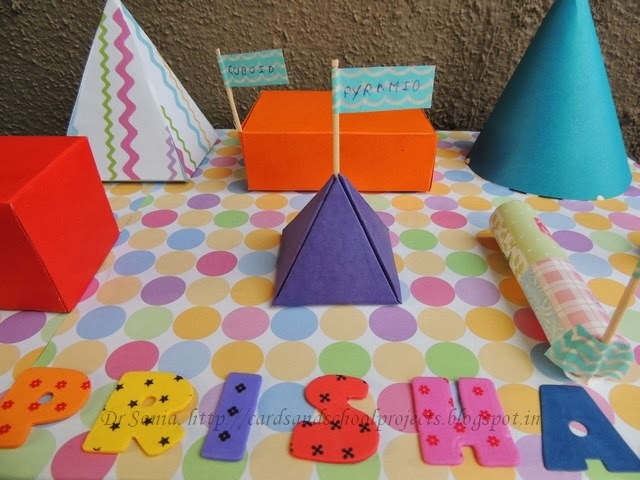 Do tell me how you liked our easy paper decoration. 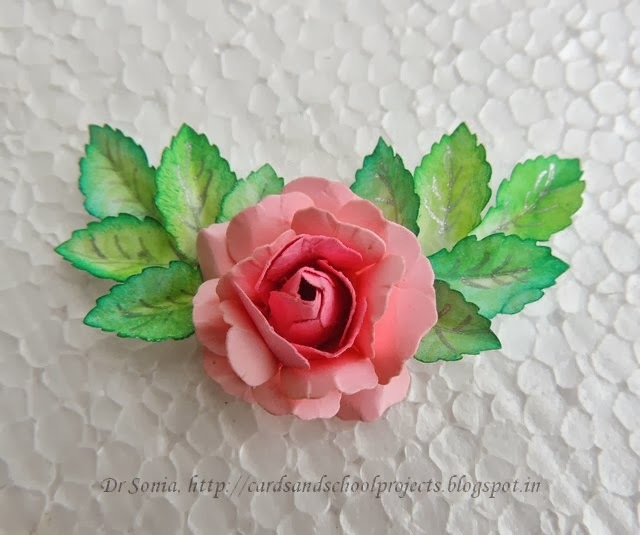 Dear friends,in the recent past I have bombarded you with lots of foam flowers..well now sharing ceramic flowers made using ceramic powder and white glue. 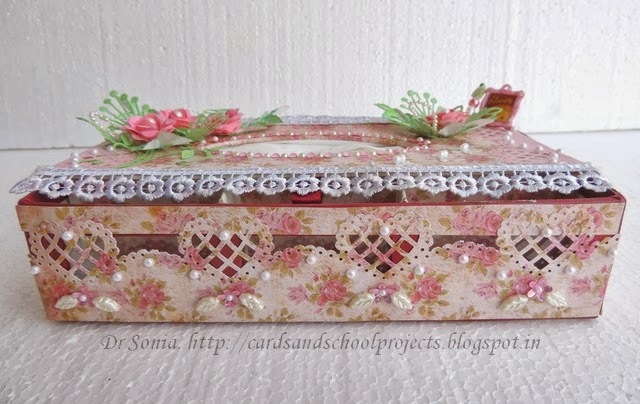 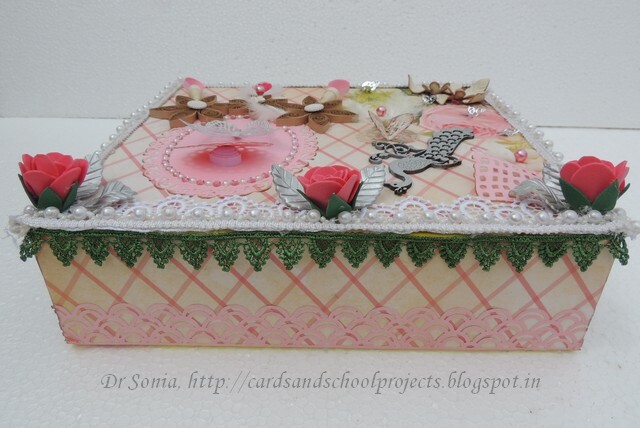 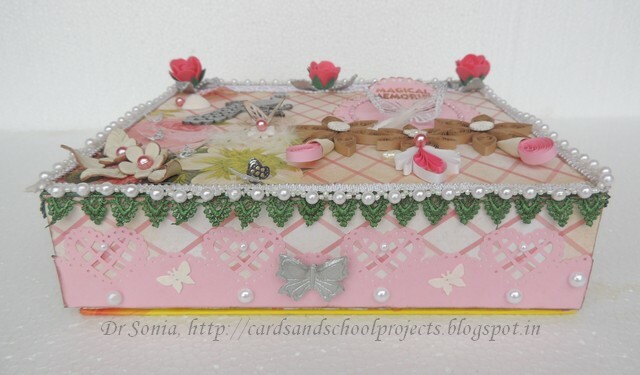 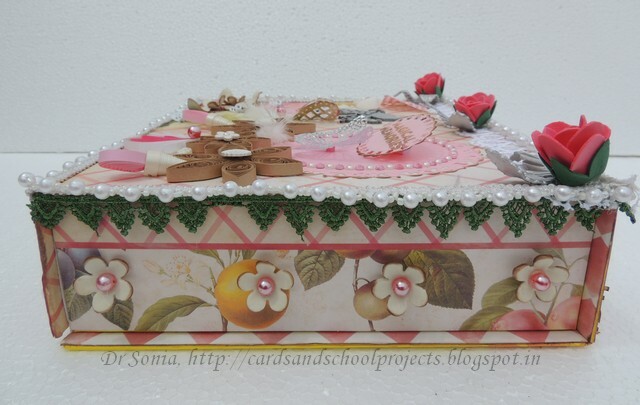 I used 2 pattern papers to alter this box into a memory box. 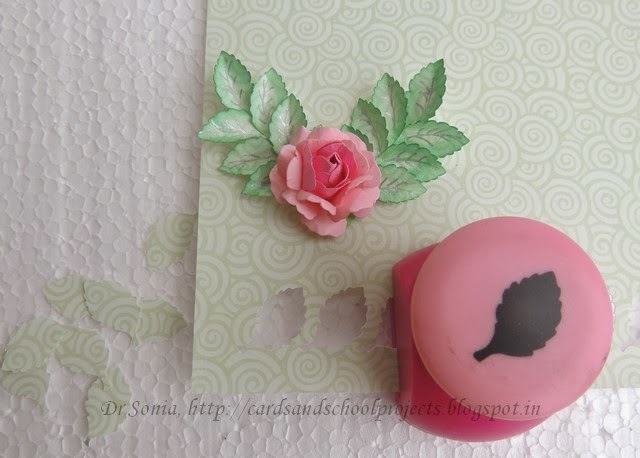 I used a plunger cutter to cut the butterfly from homemade ceramic dough.I experimented with normal pearl acrylic paint but it didnt look so nice.Later experimented with spray paint and got a beautiful shiny silver hue on my handmade ceramic butterfly. I kept the ceramic flowers and leaves uncolored..just added pearl centers and distressed the petal edges to blend with the rest of the box! 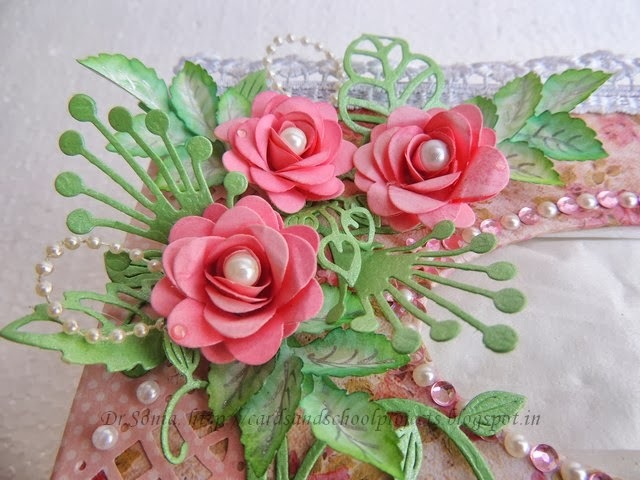 I love how delicate looking yet sturdy these ceramic flowers are! 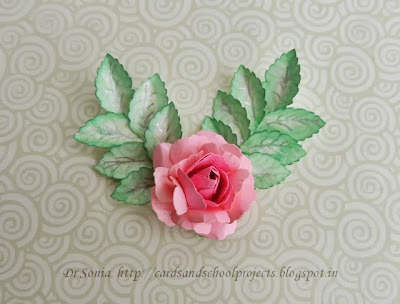 These ceramic flowers are the successful ones of my experiment.They were super easy to make but my 2nd attempt at making homemade ceramic dough didnt turn out too good! !Once I perfect the ceramic dough recipe and techniques will share a tutorial on how to make your own handmade ceramic flowers. 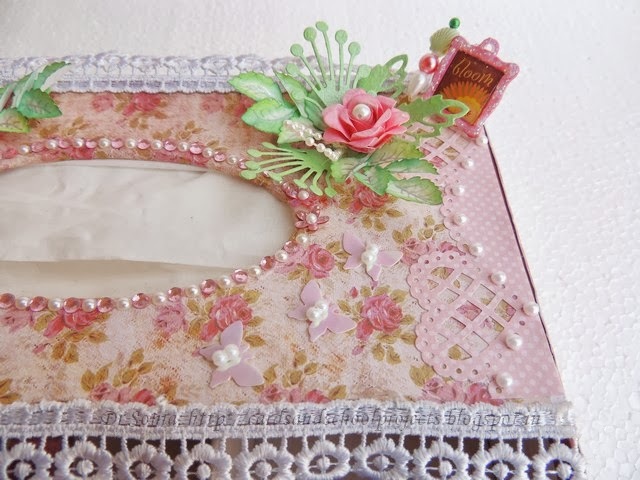 I lined all sides of the box with floral and fruit themed pattern paper [DCWV]and added more handmade ceramic flowers. The foam roses made with this Foam Rose tutorial has silver handmade ceramic leaves. 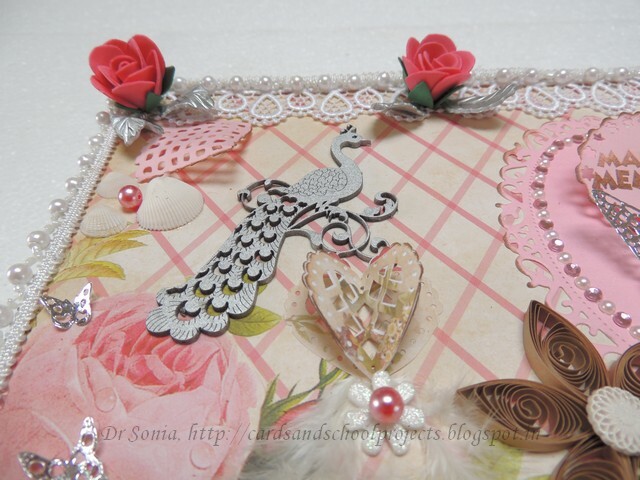 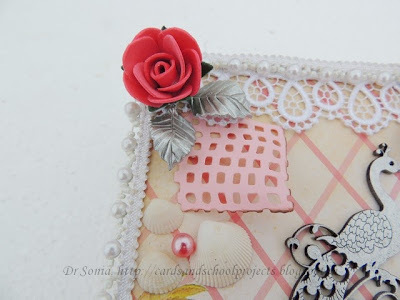 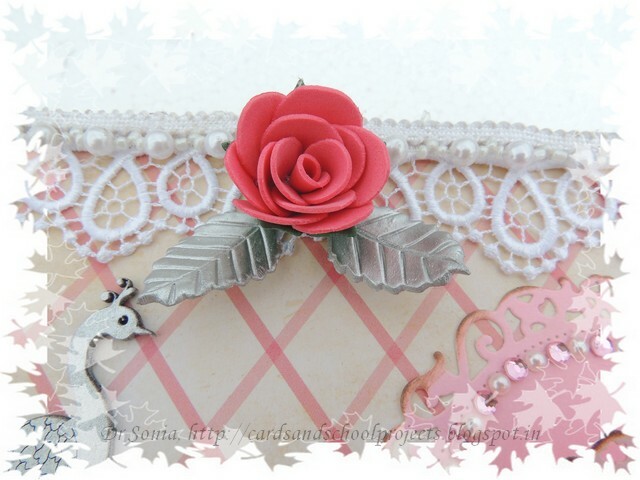 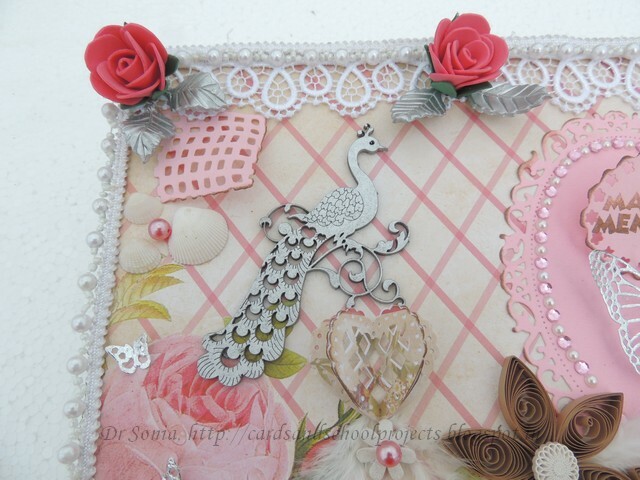 Inserted a die cut paper net [Provocraft die]with distressed edges under the ceramic leaves and places some shells and a pearl near the foam rose flower. I spray painted the chipboard peacock and placed it on a 3 D pedestal made of 3 folded MS punch hearts. 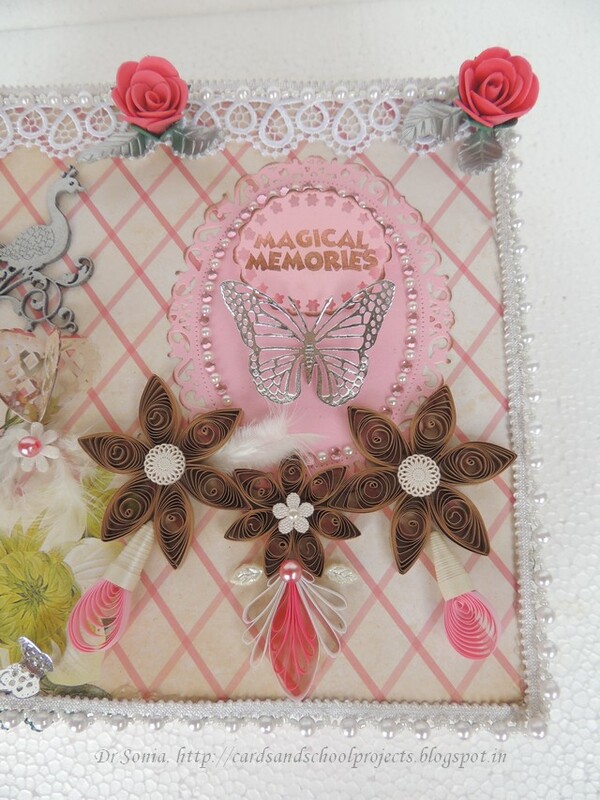 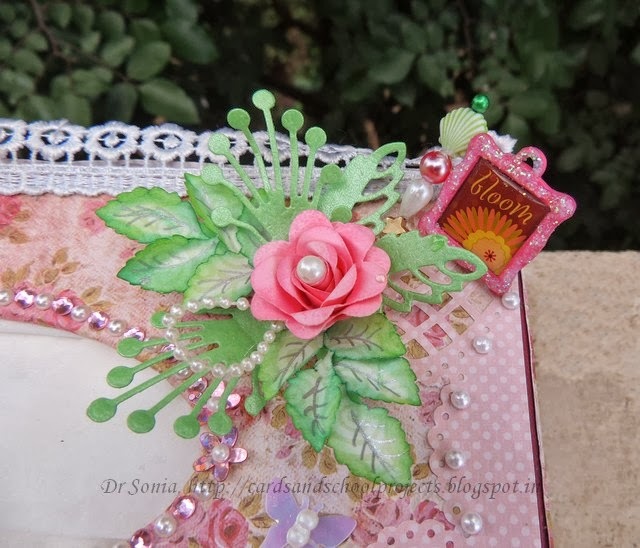 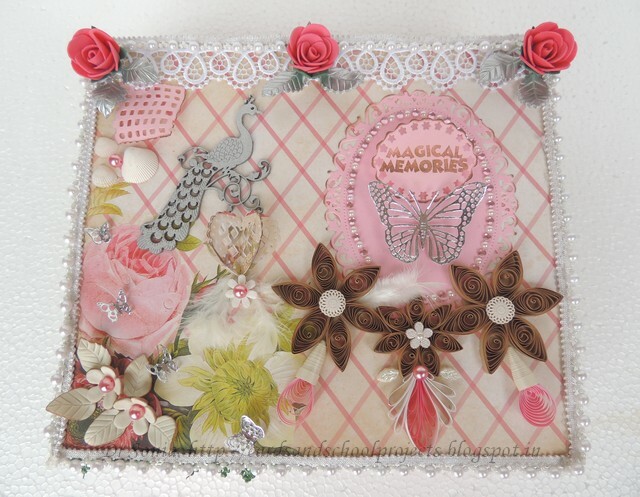 Distressed the edges of Spellbinder floral oval die cuts and popped up the stamped "Magical Memories" sentiment on a quilled shape[ can be better seen in a side view picture above].To gel wit the rest of the project, added some brown and pink quilled flowers! 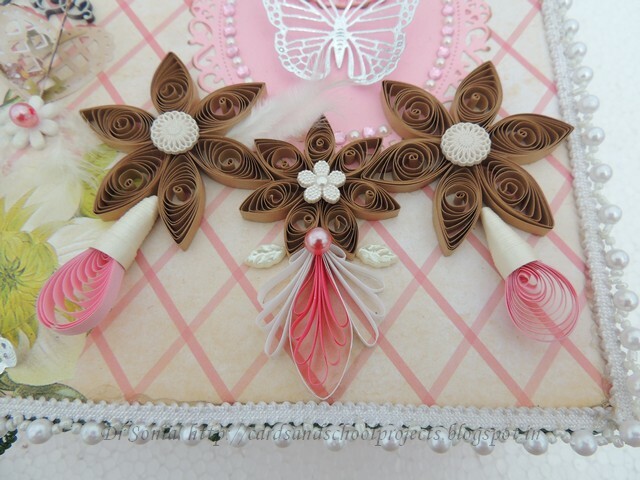 Added pearly buttons on the centers of the quilled flowers. 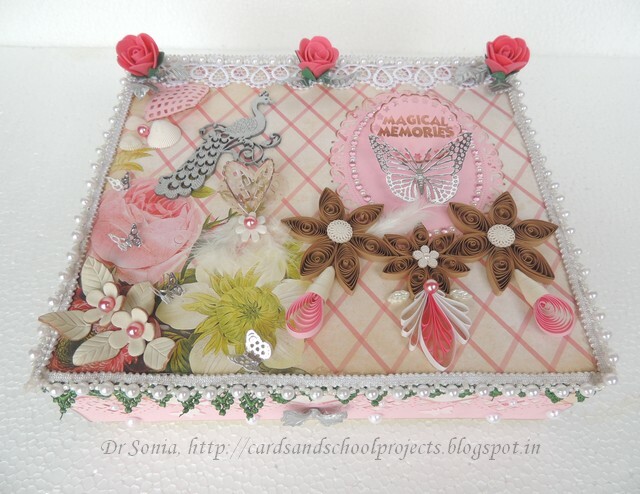 I hope you are still with me in this visual trip!! 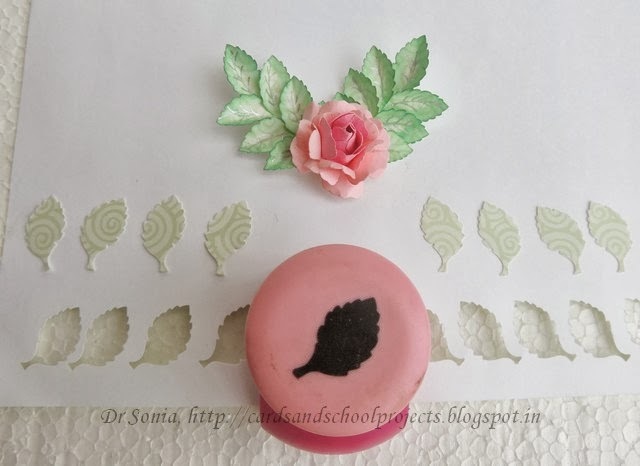 And wish me luck to get the ceramic dough recipe perfected so that I can soon share a tutorial to make lots of ceramic embellishments including handmade ceramic clay flowers.